[S758] W. W. Williams, Lorain County Ohio, page 290. Caroline M. was born in 1845. She married Horatio W. Eggleston, son of Nathaniel Eggleston and Emily Hillyer. Caroline M. died in 1928. Laura Hubbard was born circa 1790. She was the daughter of Elijah Hubbard and Penelope Holcombe. Laura Hubbard married Joshua Kendall on 14 June 1810 at Granby First Congregational Church, Granby, Hartford Co., CT. Laura Hubbard died on 14 October 1853. From Carol Laun: McPherson incorrectly assigns a daughter Luna" to Penelope David Goodrich; Luna is a misreading of Lura, and her name really was Laura Hubbard. The 1800 will of Elijah Hubbard names his wife Penelope, adopted son Horace, son Rodrock (Rodriac) and daughter Laura. She is called Lura in her mother’s will. Laura was born c.1790 and married Joshua Kendall 14 June 1810 in Granby’s First Congregational Church and died 14 Oct 1853, age 63. She is buried in the tiny Pratt Cemetery on Creamery Hill Road. She was buried at Pratt Cemetery, Granby, Hartford Co., CT.
George and Catherine were enumerated in the 1900 Shelby, Shelby Co., IN, federal census. He was a farmer 43, she was 44. Children in the household were John 19, Louella 18, Elizabeth 16, Minnie 14, Edward 11, Victorena 8, Alfred 6, and Ira 4. They were again enumerated in Shelby in the 1910 federal census. He was a farmer and both of his parents were born in Germany. 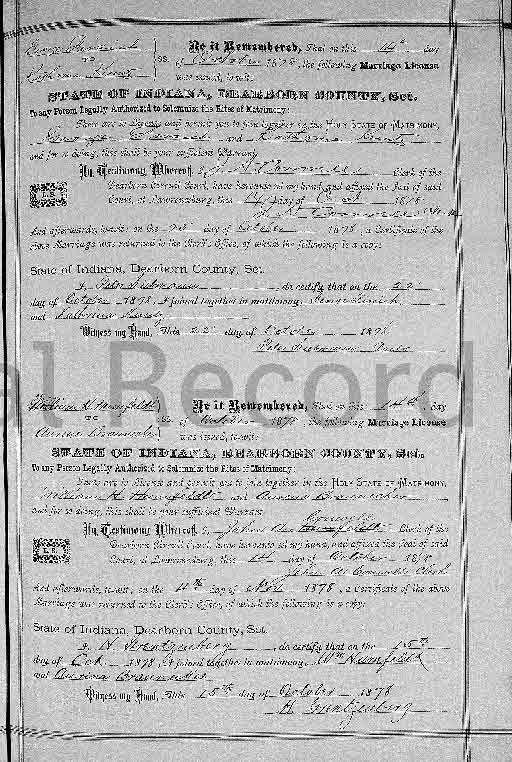 [S311] Unknown compiler, "Indiana Marriages, 1811-2007," database with images, FamilySearch (https://familysearch.org/ark:/61903/1:1:XXYC-65Q : 8 December 2017), George Firsich and Kathrina Kuntz, 22 Oct 1878; citing Dearborn, Indiana, United States, various county clerk offices, Indiana; FHL microfilm 1,313,302. [S807] Find A Grave, online http://www.findagrave.com, Find A Grave, database and images (https://www.findagrave.com : accessed 12 April 2018), memorial page for George Firsich (20 Jun 1856–30 Aug 1923), Find A Grave Memorial no. 177660175, citing Saint Vincent de Paul Catholic Church Cemetery, Waldron, Shelby County, Indiana, USA ; Maintained by Rita Osborne (contributor 47817349) . [S182] Social Security Death Index (on-line), Ancestry.com, SSDI, Ancestry.com, SSAN 309-28-0884. Wison Cary Nicholas Randolph was born in 1834. He was the son of Thomas Jefferson Randolph and Jane Hollins Nicholas. Wison Cary Nicholas Randolph died in 1907. Meriwether Lewis Randolph was born in 1837. He was the son of Thomas Jefferson Randolph and Jane Hollins Nicholas. Meriwether Lewis Randolph died in 1871. Frank Ronald Stemp was born at Wansted, England. He married Martha Holcombe, daughter of Frederick Wainwright Holcombe and Dorothy Doolittle, on 30 September 1937. Frank Ronald Stemp died on 21 October 1985 at Anne Arundel General Hospital, MD. F. Ronald Stemp, of Annapolis, a transportation specialist who worked around the world died of a heart attack Monday at Anne Arundel General Hospital after a brief illness. Mr. Stemp was born in Wansted, England, and grew up in Edinburgh, Scotland. He attended Merchiston Castle College and was a graduate of the University of Edinburgh in 1927. After serving as a railway consultant in Argentina for a time, he became president and general manager of the Bermuda Railway in 1931. He was a pilot with the Royal Air Force during World War II until leaving the service because of injuries. He then flew dignitaries from Europe to the United States during the war. In 1942, he joined the Aluminum Company of Canada and three years later came to Baltimore as district manager for British Overseas Airways. He became an American citizen in 1947 and was sent to Brazil as a railway consultant with the Truman administration's Point-4 program to aid South America. While living in Annapolis from 1952 to 1957, he married the former Martha J. Currier, who survives him. In 1957 he was a transportation advisor to Taiwan for the U.S. State Department. In 1964 he joined the International Executive Service Corps and went to West Africa to help secure business expertise for the underdeveloped countries there. He retired in Bermuda in 1967 and returned to Annapolis. His wife is his only survivor. Helen Porter married Stoecker Francis Holcombe, son of Ulysses Owen Holcombe and Gertrude Alberta Stoecker. Martha Ann Jackson married Richard Owen Holcombe, son of Ulysses Owen Holcombe and Gertrude Alberta Stoecker, on 17 January 1939. [S182] Social Security Death Index (on-line), Ancestry.com, SSDI, Ancestry.com, SSAN 508-01-3145. [S759] Dottie McCoy Rayhawk, "Polly Case," e-mail to James H. Holcombe, 8 April 2013. Jonathan Francis Warner was born on 1 July 1872 at IN. He was the son of Jonathan T. Warner and Mary Trenkenshuk.1 Jonathan Francis Warner was also known as Frank J. Warner. He married Katherine Zeien, daughter of Jospeh Zeien and Anna Mary Recherd, on 7 June 1905 at Marion Co., IN.2 Jonathan Francis Warner died in 1917. Frank J. and Catherine were enumerated in the 1910 Indianapolis, Marion Co., IN, federal census. He was 36 working in a machine shop, she was 34. Children in the household were Agnes 4 and Margaret 2. Both Jonathan and Katherine died shortly after the 1910 census and the two girls went to live with their paternal aunt, Margaret Clements. They were enumerated in the 1920 Indianapolis census, Ward 13, ED 234, in the household of Margaret "Clemments" (widow of Peter, b, 1859, d. 1910, m. 1901), 1617 South Talbot Street, as Agnes 14, and Margaret 12, Clemments. Also enumerated was Peter and Margaret's son Peter C. age 17. [S336] Ancestry.com, Indiana, Marriages. Salt Lake City, Utah: FamilySearch, 2013.Ancestry.com. Indiana, Select Marriages Index, 1748-1993 [database on-line]. Provo, UT, USA: Ancestry.com Operations, Inc., 2014. (Marriage of son Jonathan). [S832] Certificate, Frank J. Warner and Katherine Zeien marriage of 7 June 1905, Certified copy from Marion County Clerk, Records Management, 1330 Madison Ave., Indianapolis, IN 46225. [S753] Scott Steward and Christopher Child, Judge John Lowell, page 15. [S753] Scott Steward and Christopher Child, Judge John Lowell, page 14.